In keeping with the spooky theme I printed all the parts in glow in the dark plastic. I found the perfect little zip case to carry it around in. I opted to do the headphone jack mod. I only really have time to play at night, and don't want to keep my other awake. Headphones means the switch had to go on the back. Very nice! Does the tin glow too? 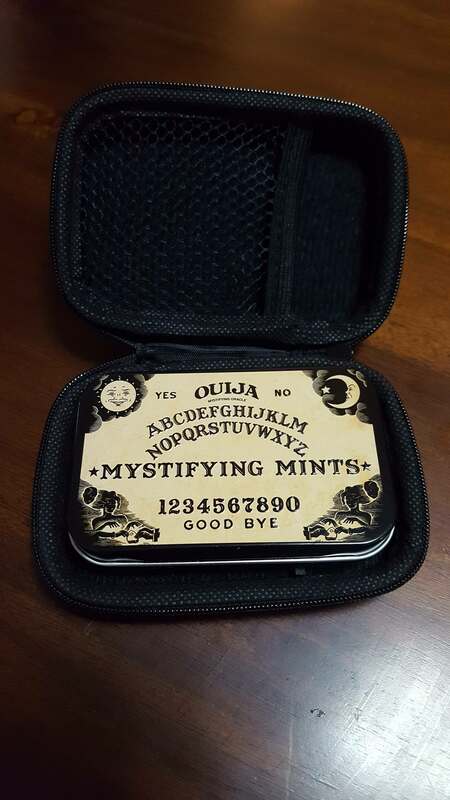 I've got a Mystifying Mints tin I'm saving for a V3 but mine's the color of old parchment. Looks really nice. I like the glow in the dark, and the actual nice white tin. When I built my ouija minty pi it was the same parchment yellow mentioned above hehe. I wish the tin glowed n the dark. Looked like it might have, but nope. Yeah, I saw the tins again at the halloween store this year, and they had the parchment colored tin. I like this one better. I bought the same tin because of this post! Can't wait for my MintyPi parts to come in!! To reiterate what TheTallDragon asked, where did you get the case? little zip cases can be found here, lots to choose from on ebay and aliexpress, but this is the first link I found. The original seller I bought from no longer exists.